Last day in Rome | Walk with us! Yesterday morning we had a late start to our meetings with the first one scheduled for 10:45 AM with the Congregation for Catholic Education. With all that time on my hands it was a perfect opportunity to do my walk after breakfast rather than in the afternoon as has been my normal routine here in Rome. During my 12 years living here I found many interesting walks covering different parts of the city. 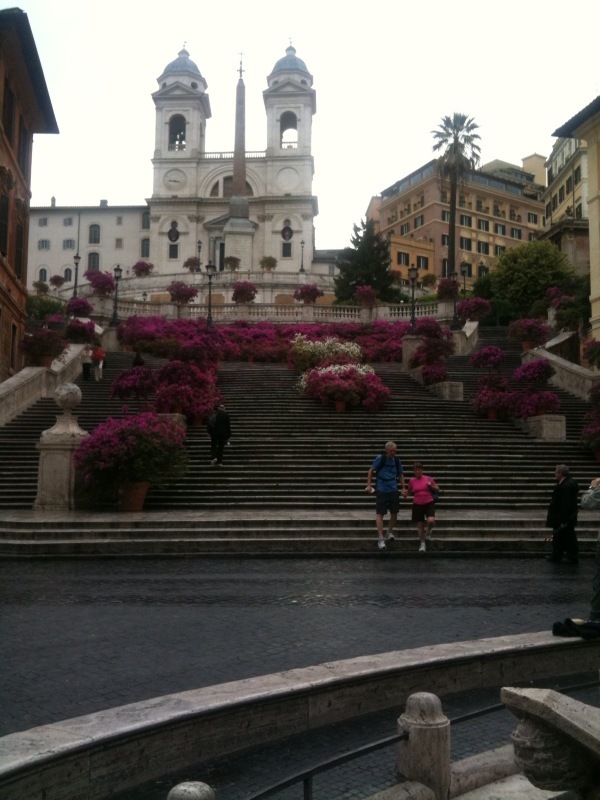 In spring one of the most beautiful spots to visit are the Spanish Steps. From our hotel on Via Alberico II (about a half a mile from St. Peter’s) to the Spanish Steps takes about 35 to 40 minutes, depending on both traffic and the number of tourists. I say tourists as they often come in groups, and groups tend to take up the entire sidewalk. I often looked for side streets not frequented by groups so I could keep up my pace. As you can see from this photo the Steps are all decked out with flowers. As I was here at about 8:15 AM it was still quiet but later in the day the place will be mobbed and lots of people will be sitting on the steps. It’s one of the places to see and be seen. Our meeting at Catholic Education was actually pushed up by half an hour to accommodate the staff as they were going to attend a memorial Mass for Cardinal Grocholewski’s brother who died recently. We were not scheduled to meet with the cardinal but with Archbishop Brugués, secretary of the congregation. We had an engaging conversation on various topics. It was good we had both Br. Frank Carr, FSC, and Tom Smolich, SJ, with us as much of the conversation centered on higher education and as the US Jesuits run 28 universities and the DeLassalle Brothers three we were well covered on this topic. Later in the day we had two meetings going on at about the same time so we split our presence at the Congregation for the Doctrine of the Faith and the Pontifical Council on the Family. The later was the first time LCWR and CMSM met with this council. I attended the meeting at CDF along with Tom Smolich, SJ, and Paul Linninger, Conv. OFM. Today is our last day in Rome, and we have two meetings scheduled this morning. First with the Congregation for the Clergy and then we will end our visits at Oriental Churches. With the afternoon free I am going to go to our generalate for pranzo and a meeting with Fr. Ornelas, our superior general. It will also afford me the opportunity to do my laundry. I will return to Domus Carmelitana this evening for our final debriefing. In the morning we will begin the long journey home. I will try to write one final reflection on the flight home. I’ll certainly have enough time. I am scheduled to leave Rome’s Fumacino airport at 10:45 a.m., and after changing planes in Newark arrive in Chicago around 4:30 p/m/ local time. I’ll then try to catch the next bus to Milwaukee and hope to be home by 8:00 p.m. Add seven hours to the local time in Milwaukee and you’ll have an idea of the length of my day.